So, I went to go see Sorcerer’s Apprentice today. A movie that starts with a crawl and a Voice Over (even if it is Ian McShane) is a bad movie in my book just because the writer is me cringes at the short hand. Crawls should only be reserved for Sword and Sandal or Arthurian movies since nobody nowadays even remembers High School History Class except History Majors. The entire movie boils down to this: Alfred Molina was one of Merlin’s three trusted wizards until he went off the rez and joined Team Le Fay and before Le Fay can do any real damage her soul is put into Cage’s girlfriend’s body and then put into a jar. Merlin places a spell on all three so they can do something and await Merlin to get re-incarnated or something. Yep. I know, or something is not something you want the audience to say after seeing the movie. Unfortunately, this is not Pirates of the Caribbean. The problem is: The script and why is Nic Cage the good guy in this movie? Molina is a wonderful villain and I’m sure the script started out well but there’s so much is glossed over that I almost fell asleep. The Criss Angel-rip off and the Salem Witch Trials Witch was perfect until they get tossed. 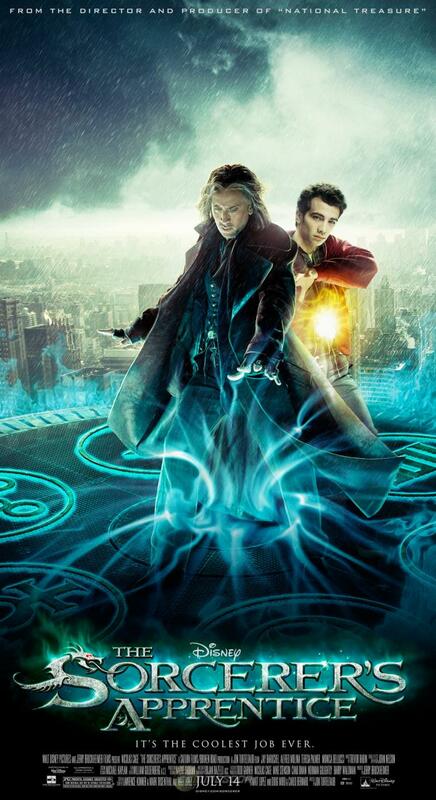 The whole science and magic plot line was great, Tesla Coils were cool and Jay Baruchel does a great job with what’s given to him and if the sequel ever rolls around with just him and no Cage, it might be worth seeing….on cable. The roles needed to be reversed, Molina being the good guy and someone else being the bad guy would have been nice. I don’t mind Nic Cage’s acting, Raising Arizona is one his better works. But he did not work in this movie. One has to wonder if he was doing double duty between this movie and Season of the Witch since they really looked like the same movie there for the first five minutes. The idea was there. They even paid homage to Fantasia which was fine and also a sore thumb. The execution and plot just sucked. Monica Bellucci not heaving out of her dress? I don’t care if it is Disney. Did we forget Rebecca DeMorney’s heaving D’Winter in The Three Musketeers? Some of us do remember movies from 1993. I’m sure Alice Krige would have made for a great Morgana Le Fay but the info dump in the first five minutes (a similar problem arose with Salt) needed to be extended, it’s blink and you miss her. And, the final battle with CGI Le Fay is boring and tedious. This movie trailer follows the one rule that all movie trailers do: Show all the good stuff. Unfortunately the kickin’ music was nowhere near the movie. The movie plays it: SAFE. And, safe and magic don’t go together. Wait for to come on cable.